Jedi Surf Hostel i Limassol, Kypros: Bestill nå! This hostel was created for those who want to find some inspiration for their veins. 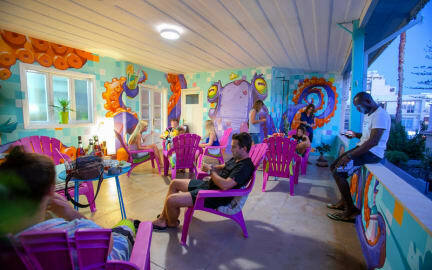 Creators of Jedi Surf Hostel really love the bright energy and creates unique hostels around the world for years. We are creating not just hostels but the worldwide community. We want our hostels would be not just a place to sleep, but also a place where you are able to find fresh energy, inspiration, and co-thinkers to be a friend with. We want our hostels to become your second home. In our hostel, you will find a terrace where great graffiti will inspire you, small cozy yard and a kitchen where you may cook and eat some dishes, talk to people and find new friends. Jedi Surf Hostel has everything you may need nearby. There are a beach and a municipal park in 500 meters distance. Shops and cafes are surrounding the hostel. The hostel has shared rooms and private rooms. In shared rooms, every bed has a shelf for a phone or other stuff, a socket for charging your phone or a laptop, a lamp for reading and a locker where you may place your stuff. Also, every bed has lovely curtains so you will be able to sleep in your personal area in any daytime if you want. Linen is included in the price. The hostel provides daily cleaning service and linens are changed once a week. Private rooms have more personal space to sleep and a higher level of comfort for those who are critical to a personal space. Check in from 14:00 to 21: 00. Check out from 09:00 to 12: 00. If you want to check in later, than 21:00, you should notify the administration in advance. Payment upon arrival only by cash. Credit cards/debit cards will not be accepted as payment of the balance upon arrival.